Make this tasty snack for your child, and see how much they will love it! 1. Wrap the potatoes in an aluminium foil and bake in a hot oven at 200°c till tender for about 30 minutes. 2. 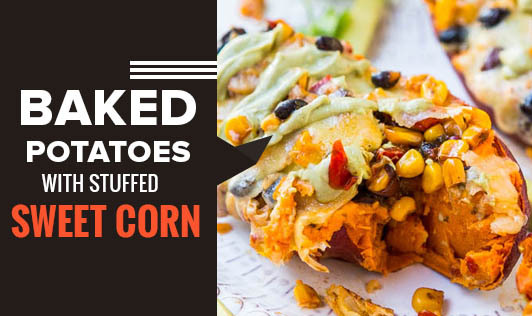 Cool slightly, remove the foil and split each baked potato horizontally into two. 3. Scoop the potato halves a little so that a slight depression is formed for the filling. Keep aside. 1. Heat the butter and fry the onions for ½ minute. 2. Add the green chilli and fry again for a few seconds. 3. Add the corn, milk and corn flour mixture, salt and pepper and cook for 2 minutes, till the sauce thickens. Keep aside.